Apple Apologizes For Slowdowns, Lops $50 Off Battery Replacement Cost : The Two-Way "We know that some of you feel Apple has let you down. We apologize," the company said in announcing a plan to help customers speed up their older iPhones. 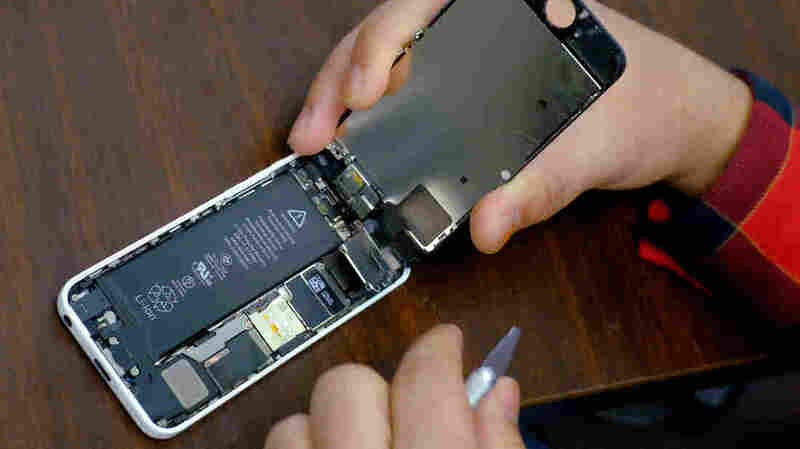 Replacing batteries will speed up phones, Apple says. Here, an iPhone is seen being repaired in a shop in New York. A week after admitting to intentionally slowing down older iPhones without telling customers, Apple is apologizing and slashing $50 off its normal $79 price to put a new battery into old phones. "We know that some of you feel Apple has let you down. We apologize," the company said in announcing the change. It added that there has been "a lot of misunderstanding about this issue." The $29 battery replacement price will apply to any out-of-warranty iPhone 6 or later and will begin to be available in late January, Apple says. The worldwide program will continue through December 2018. Apple is responding to criticisms that followed its confirmation last week of independent tests that showed processors in several models of iPhone 6 and 7 were slowed down if their owners had updated their devices' operating system, or iOS. Apple said it took the step to ease demands on older batteries to prevent the phones from shutting down suddenly. But many users aired their frustrations that the company would tinker with how their phones operate, saying that the admission confirmed long-held suspicions that new software was slowing down phones that were only one or two years old. And because the biggest changes to Apple's iOS usually come in tandem with a new iPhone model, the timing fed accusations that the approach also allowed Apple to use "planned obsolescence" to push customers to buy new phones. It was a Reddit post by a user named TeckFire that drove intense interest in Apple's battery strategy earlier this month, after the Redditor noticed that different versions of the iPhone 6 series were running at vastly different speeds — and that processor speeds picked up again if the battery was replaced. Confirming that dynamic, Apple says that "when a chemically aged battery is replaced with a new one, iPhone performance returns to normal when operated in standard conditions." Apple has said that its phone batteries are meant to keep up to 80 percent of their capacity for 500 complete charges. But if a user was able to deplete and charge the phone every day, that would equal less than 18 months. The tech giant also says it will issue a new iOS update sometime in early 2018, "with new features that give users more visibility into the health of their iPhone's battery, so they can see for themselves if its condition is affecting performance."